We’re going to a party! We’re going to a party! We need to be in temple by 10:30am but I have an appointment at the hair place to blow out my curly curls and get trims for my boys at 9am. It’s 8:15am. We have a half an hour to get out of the house. “These pants are too tight!” My son yells, and tosses them out of his room into the hall. I hop over, pulling up my tights as I go and get smacked in the face with the offending black pants. “Didn’t you wear these last week?” I ask, untangling the inside out legs and searching for the tag. Not that it matters. 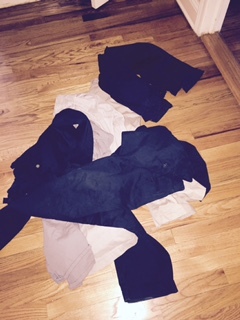 At almost 13, things that fit one week, no longer fit the next. “I’m ready!” My middle son announces; walking past in a shirt clearly buttoned by a drunk. “Um, let me help you,” I say, starting to undo and redo. Another pair of pants flies out of my oldest son’s room and I hear him stomping around angrily. I run back into my room to fix myself. My husband emerges from our closet. “This good?” he asks, holding a blue tie against his grey shirt. I nod that it’s fine and run into the bathroom to play around with some make up my mother brought over. “I know you like to be ‘natural’, but just something to brighten your eyes? And skin. And maybe a little lipstick?” She suggested so coyly, you barely knew you were being strong armed until you were pinned. Later, I would use a very similar tone trying to convince my son that slightly shorter hair looks better than never combed hair. “I know what I’m doing,” I had snapped, and am happy she’s not here now to watch me put lip liner under my eyes. “I’m hungry!” My middle son barges in and announces as I’m struggling to close the clasp on my necklace. “Forget it! I’m not eating!” He huffs and storms out as my 12 year old storms in. He is frustrated to the point of tears. “I’ll find you something. I promise. Just give me five minutes?” I ask, looking hopefully and reassuringly into his stressed face. He calms down, gives me a hug and a blessed five minute reprieve to get myself together so we can get to the hair place and then to the temple for the b’nai (double) bar mitvah and then to the other one across town and the ensuing parties that follow. “It’s raining out!” I hear my husband yell and a glance out the window confirms it. Freaking great. Did I mention the blow out for the curly hair? My 7 year old cartwheels past, wearing only his Skylander undies. We’d better get to that party soon. I need a drink. Posted in Uncategorized and tagged bar mitzvah season, getting out of the house, getting ready for a party, going to a party, parenting, party. Bookmark the permalink. Thank you! It’s crazy! Thank goodness the parties are so fun! LOL this had me laughing at my desk. You perfectly described any day at my house with my 4 boys (5 is you count the husband). Oh no. We never blame the people who are in charge of the drinks. This made me laugh! I remember those days so well and believe me when I say one day you will miss all of the chaos! Then you get grandbabies and it’s all worth it! Oh I know it!! I really try to appreciate the crazy. When you’re a good cartwheeler, you just got to show it off. Mom physics theorem #5 – The more you have to rush to get your kids ready on time, the less ready they become. The pain. Trying to get my girls out the door to anywhere is like trying to wrangle flying monkeys. Hope you had a wonderful time that night. Ha! Thanks. It can be ridiculously, amusingly and frustratingly challenging. I loved the line, “I don’t want cereal. I want pancakes.” My girls (I have three) do things like that, too. And I will feel guilty about not making the pancakes, when clearly I shouldn’t. Cereal is available and ready in seconds, kids! Enjoy! Especially when you’re totally late! OY! There are only 2 of us, and still it’s hard to get out of the house without leaving something behind, or rushing like a lunatic as the minutes fly by. Seriously, you deserved that drink. Also, Murphy’s Law states that if you have an appointment to blow out your hair, it will definitely rain. Right? What’s with the rain thing?! I guess that’s just how some days are. Still, it was a wonderful day. Made me smile. We went to my niece’s Bat Mitzvah in January and discovered the kids had decided to make some adjustments after we finished packing so their dress clothes weren’t exactly the ones we anticipated showing up. Was crazy time then, but fun now. 7th grade is like a late night crazy party every weekend. It’s insane.